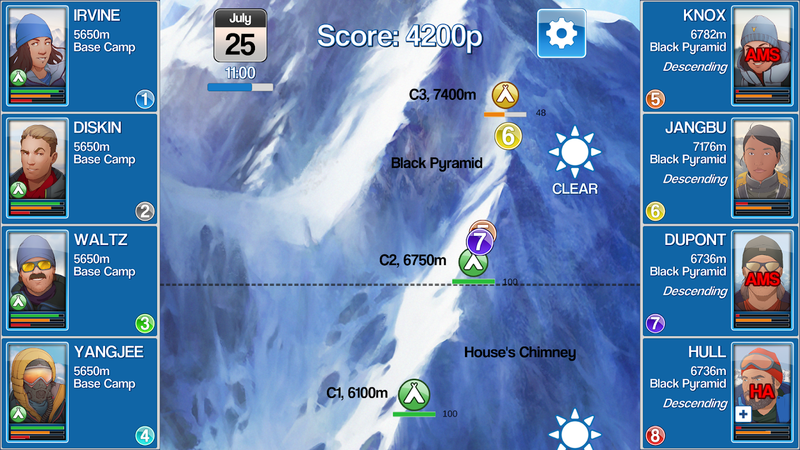 Encouraged by having Turtliac accepted on the App Store (after some pain) I worked on my Everest game again. I was close to abandoning the project many times but came back to it. I started over with completely new versions of the game 6 or 7 times. I tried to build some versions completely with a raw model and no UI. I also tried different types of UI. In the winter of 2014 I decided to let someone help me with the graphic design. Until then I had only used placeholder photographs. I wanted real portraits that I had the full rights to. I also wanted a new map for the main screen. I put out a request on eLance (UpWork) and around 20 freelancers offered to do the graphic design. In the end I chose between a Chinese and a Spanish designer. I went for the Spanish designer in the end and she got to do the eight climber portraits, the map and a lot of the rest of the new GUI. The cost in total was $650. The retro feel of the portraits was the designers choice. I never had that as a requirement. But I was very happy and inspired by her work. 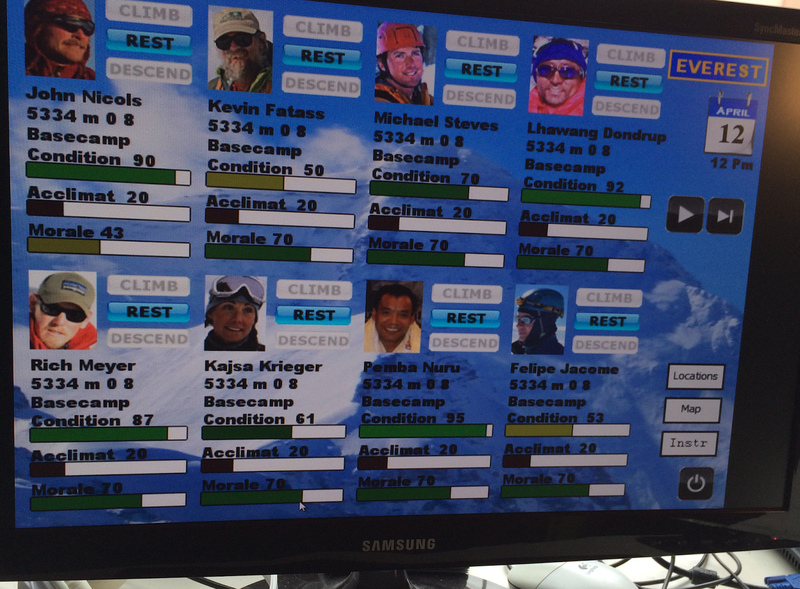 Everest Attack was developed in pure Objective-C with no other tools or add-ons. It was released as a premium $2 game on the App Store in August 2015. Jabatoba AB was registered as a company in July 2015. K2 Story is now in beta and will be released soon. It is based on the same idea as Mount Everest Story but is completely re-written and has new graphics. Beta testers wanted! Please contact us at info@jabatoba.com for a TestFlight invite! One of the first of my own projects was a simple game that I called Turtliac. It was a Flappy Bird clone and programmed from scratch in pure Objective-C. No other templates or tools. It was my "hello world" as a game programmer and I was very happy when it got accepted for the App Store. Turtliac had an original score(a stupid little melody), sound effects and graphics bought from Graphic River. The turtle also had the recorded voice of my eleven year old son. I asked him to say something random when the turtle makes a looping and he spontaneously went "Jabatoba!". That is how the name of the company came up. I also started to build a game called Fishy Tank. The idea was to make a strict master-detail application with only two screens, very standard iPhone UI but yet interesting gameplay. The game simulates a fish tank with different species that eat each other. The goal is to maintain balance and to have as many species as possible in the tank at the same time. I bought stock graphics from Graphic River and I think the UI was rather nice. I would later build several other prototypes with the same idea but I never published the game. I wrote three or four versions of the game in GameMaker. They were playable games and worked much like I had thought but I was not satisfied. The game model started to become quite complex and was difficult to maintain in such an environment. I also knew that I wanted to build games for mobile phones and GameMaker did not give me much help with the GUI. In order to use GameMaker's iPhone bridge, one had to first become a licensed Apple Developer. When I got licensed I started to browse Apples programming resources and the XCode environment. CS193p is an advanced course in iPhone programming on Stanford University. It is made available online on iTunes University. The course consists of 14-15 real streamed lectures and 3-4 large programming assignments. The lectures simply goes online a day after they are held at Stanford. It is lead by an excellent teacher named Paul Hegarty. The first time I started to look at the course I was stuck around lecture three or four. I could grasp most of the material up to lecture 4 but I understood why I was not a Stanford student. I must have looked at the first three lectures more than ten times. But I began to fall in love with the beauty of object-oriented programming, the academic style of the lectures, the complexity, the details. The voice of Paul Hegarty could be heard many hours a day both in my home and at my office. I started to become obsessed with programming. A few years ago I read the book "Into Thin Air: A Personal Account of the Mt. Everest Disaster" by Jon Krakauer. It tells the story of the Mount Everest Tragedy in 1996. I also read "The Climb" by Anatoli Boukreev and "Ultimate High - my Everest Odyssey" by Göran Kropp. Boukreev was one of the main guides and was partially accused of what happened. Göran Kropp turned down only one hour from the summit on the day before the disaster. 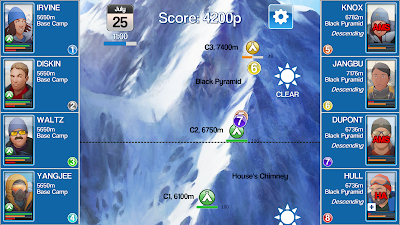 Making a game about Mount Everest came up as an idea about then. I had a strong idea about the gameplay. I wanted to focus on the places and the people. As a player one should only have to make one type of decision: when to climb. The idea was also that the game would revolve around three main attributes of the climbers: Condition, Acclimatization and Morale. Further I wanted times and places to be as authentic as possible. The game takes place between April 18 and May 31, which is when the real expeditions are carried out. The simulated climbing times are as realistic as possible. For example, a climber in reasonably good condition takes 5-6 hours to climb Lhotse Face. The first prototype was build in 2012 with YoYo's GameMaker environment. GameMaker is a fantastic and very underrated high-level programming environment. It has evolved over the years and can be used for rather advanced programming. It also has extensive, mature and well-developed education resources and tutorials. For me, GameMaker was an incredible first gaming programming environment.